Crude lingered near $57 a barrel for a third day as oil workers in Nigeria suspended a strike and repairs to a crucial North Sea pipeline proceeded apace. Futures slipped 0.2 percent in New York, erasing gains from earlier in the session. Managerial workers in Africa’s second-largest crude-producing nation halted their strike and agreed to reopen talks next month. Meanwhile, the owner of the Forties Pipelines System in the North Sea, which helps set international oil prices, said repairs to a crack that halted shipments a week ago were on track. “People that bought on the word of the strike are probably taking some profits,” said Phil Flynn, senior market analyst at Price Futures Group Inc. in Chicago. The Nigerian oil union known as Pengassan stopped work after talks deadlocked late Sunday, according to a spokesman. The union, the labor minister and Neconde Energy Ltd. will restart talks in January. A hairline crack which prompted Ineos Group to shut its Forties system on Dec. 11 “has not propagated,” the company said in an email. Repairs are expected to be complete within weeks. 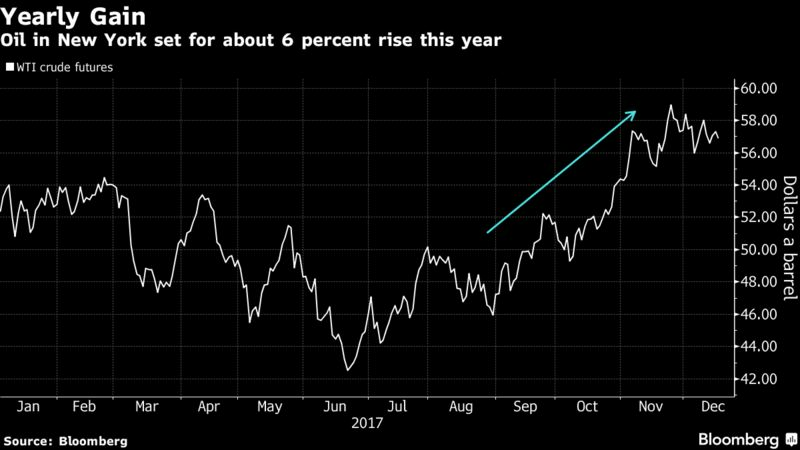 Hedge-fund managers have amassed a record number of bullish wagers on London crude prices, creating conditions that could trigger a selloff as the Forties restart date approaches, said Bob Yawger of Mizuho Securities USA. “The only thing that’s holding the market here at these levels is the Forties problem,” said Yawger, Mizuho’s New York-based director of futures. “The potential is there for people to start bailing on the loaded-up speculative position. I would tend to think there will be a slow unwinding of these positions in anticipation” of the line restarting soon. Oil in New York is poised for about a 6 percent gain this year as production limits by the Organization of Petroleum Exporting Countries and other major suppliers erode a worldwide glut. The effort to curb excess output could be dashed by U.S. shale drillers, who are forecast to lift American oil production to a record next year. West Texas Intermediate for January delivery, which expires Tuesday, dropped 14 cents to settle at $57.16 a barrel on the New York Mercantile Exchange. Total volume traded was about 23 percent below the 100-day average. Brent for February settlement rose 18 cents to end the session at $63.41 on the London-based ICE Futures Europe exchange. The global benchmark traded at a premium of $6.19 to February WTI. The Brent net-long position -- the difference between bets on a price increase and wagers on a drop -- rose 1.8 percent to a record 544,051 contracts in the week ended Dec. 12, according to data from ICE Futures. Longs increased for a third week, also reaching an all-time high. During the same period, bullish bets on WTI were near a nine-month high. The Energy Information Administration sees crude output at major U.S. shale plays reaching 6.41 million barrels a day in January, according to a monthly Drilling Productivity Report. Cushing, Oklahoma, crude stockpiles dropped by 2.2 million barrels last week, according to a forecast compiled by Bloomberg. This year is shaping up to be the worst for oilfield servicers since 2008, when the global financial crisis roiled markets and industries everywhere. Saudi Arabia’s crude oil exports rose to 6.874 million barrels a day in October, according to the JODI-Oil World Database.